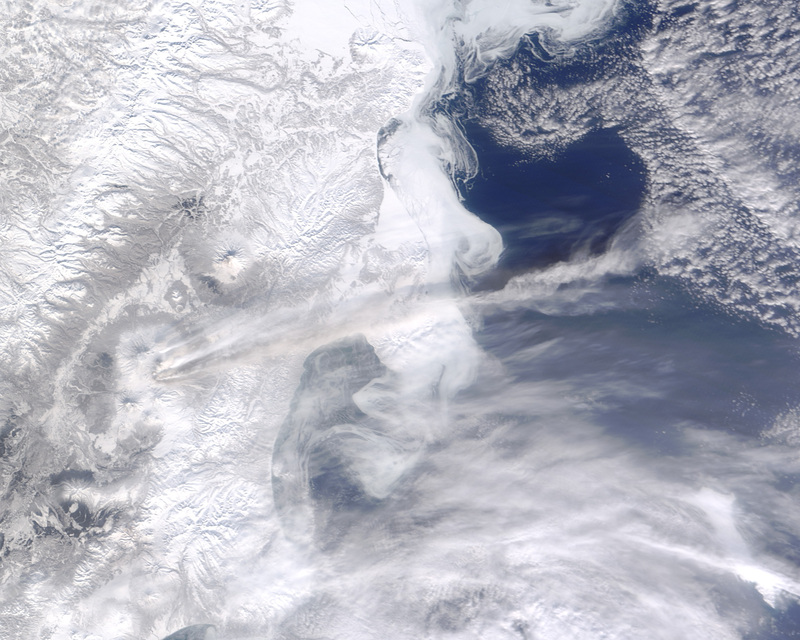 Bezymianny Volcano erupted on March 9, 2012, at 11:27 a.m. Kamchatka Time, according the the Kamchatkan Volcanic Eruption Response Team (KVERT). The eruption followed several days of increased seismic activity and elevated temperatures at the volcano’s summit. 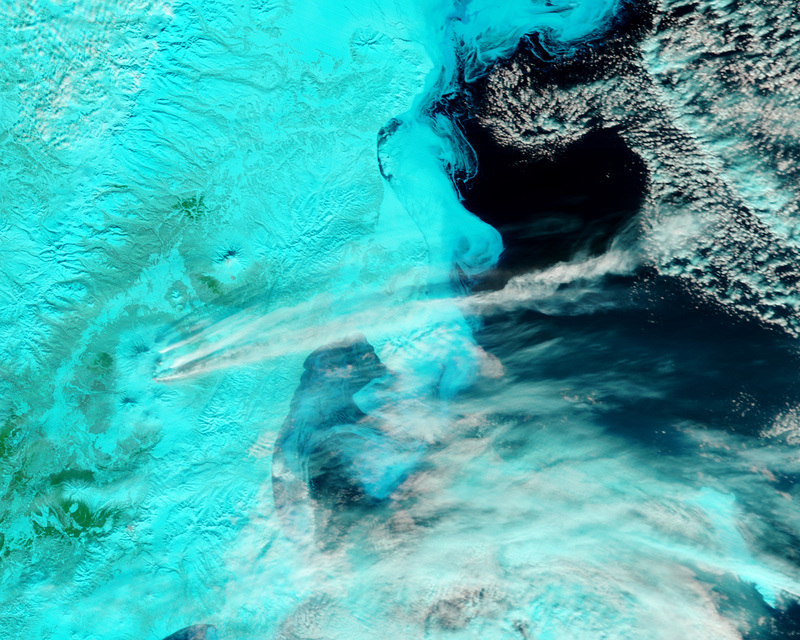 The Moderate Resolution Imaging Spectroradiometer (MODIS) on the Terra satellite captured this natural-color image (above, top) about an hour and a half later. A pale ash plume extends east of Bezymianny. The plume is easier to see in the false-color image (above, lower), which is a combination of shortwave infrared, infrared, and red light. 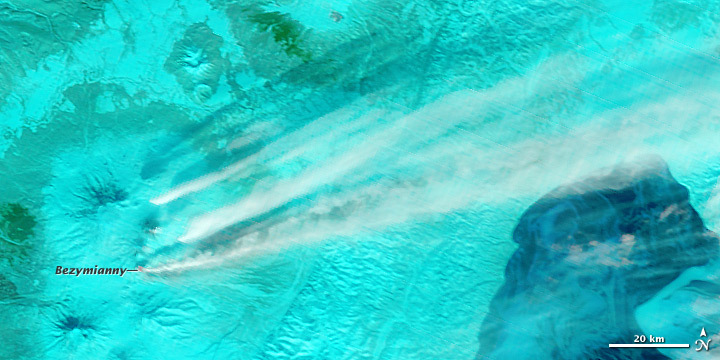 In the false-color image snow is cyan, vegetation is bright green, and clouds are white. 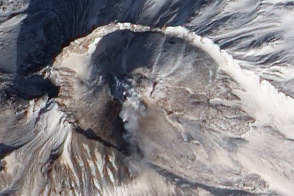 The orange dot on Bezymianny Volcano is hot volcanic material. 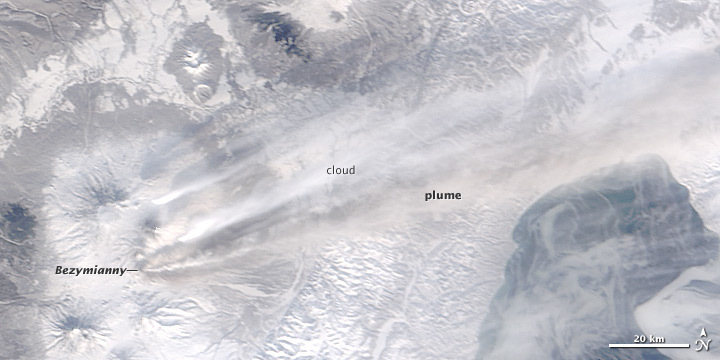 NASA image courtesy Jeff Schmaltz LANCE/EOSDIS MODIS Rapid Response Team, GSFC. Caption by Robert Simmon. 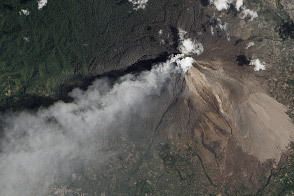 Bezymianny Volcano erupted on March 9, 2012, creating an extensive ash plume. KVERT. (2012, March 9). VONA/Kamchatkan and Northern Kuriles Volcanic Activity. Accessed March 12, 2012.